I will always welcome another project by Keef Baker since announcing the retirement of the main output under his slightly bastardised own name (Keith). This time his attention is focussed squarely on an official soundtrack for John Ossoway’s ‘River of Heaven’ role playing game released by D101. Utilising the notion that the river of heaven is the name given to the Milky Way by the Chinese, it’s easy to grasp the concept of Baker’s intentions musically as the album opens. A firm grasp of Sci-Fi enthusiasm makes way for an aural cosmos of rich starlit sounds, which utilise key essences of computer game technology sound-wise and are wrapped up with clinical, yet warm beat play that stands firm with the aesthetics of Hymen Records. There is much to be made from the press bumpf that namedrops Tron Legacy and John Carpenter soundtracks. Thematically speaking, the source material sustains the concept musically and the warping electronics enriched by glowing pads, drive home a vision of past future notions made reality; all within a balloon of modern space age electronica. As always, Baker is the consummate professional where musical structure and composition is concerned; every note has a purpose, every ambient backdrop a rich bed for harmonies to bounce across whilst the rhythm sections remain razor sharp. This is a much different album from what we have heard previously from Keef, whilst retaining the ever so slight nuances that firmly stamp home the name of the composer. 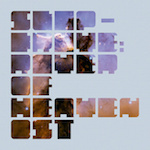 Overall, ‘River of Heaven is one of those releases that I would have loved to seen released on hard copy to join my collection of his exemplary work; from an artist with more strings than his bow could possibly brace.